In Stop The Presses! we share some of the more ridiculous press releases we receive at The A.V. Club. While this is obviously a huge honor for all parties—who, it should be noted, haven’t even necessarily been informed of the honor or accepted—it’s more than a little confusing. 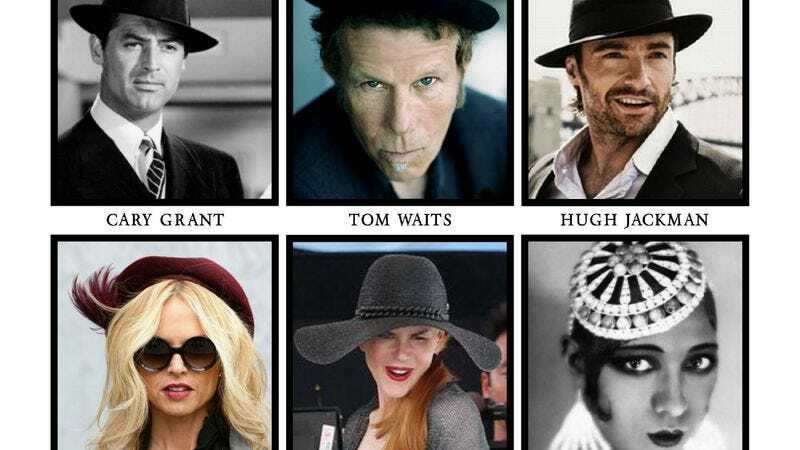 What group of people other than hat fans would honor Rachel Zoe, Cary Grant, and Tom Waits simultaneously? And does the world really know Hugh Jackman as “a long-time hat aficionado”? Do each of the nominees get the nod for a different reason, like Baker’s role as a “noted Civil Rights activist” and Kidman’s commitment to protecting “her fair skin from sun damage”? And who were the 44 other “legendary hat wearers, living and deceased” that were nominated before these six inductees were chosen? Zoe, Kidman, Baker, Grant, Jackman, and Waits are all in good company, though. Previous inductees have included LL Cool J, Kid Rock, Carlos Santana, Ne-Yo, Cameron Diaz, and Princes Diana. Hats.